If you have lifting equipment on-site, then you MUST ensure that it is safe. Don't take a chance - Lifes depend on it. Dechmont Forklift Trucks pride ourselves in our fleet of Hire Trucks which consist of Diesel Counterbalance Forklift Trucks which can be used outside to perform all types of lifting duties required. These trucks range from 1 Ton Forklift Trucks to 10-ton Forklift Trucks which are all modern Lift Trucks and only a phone call away as we have our own dedicated transport to deliver to our customers all over Scotland. We also have a fleet of Battery Operated Counterbalance Forklift Trucks in a variety of different models, whether it be a 3 Wheel Electric Counterbalance or a 4 Wheel Electric Counterbalance and capacities to suit all applications from 1 Ton Electric Counterbalance Forklift Truck to 6 Ton Counterbalance Forklift Trucks which can be used internally to perform various duties, and indeed, in most cases outside duties. We have various Warehouse Forklift Trucks which include Reach Trucks, Pedestrian Trucks, Order Picking Machines and power Pallet Trucks all varying in lifting capacities and lift heights to suit customers’ requirements. Our fleet of Trucks are of a mixture of Gas, Diesel and Electric Lift Trucks, all of which are fully maintained and all are supplied with Thorough Examination Certificates. Many of our Fleet of Fork Lift Trucks are CAT Lift Trucks and all have various mast options. Our ethos is to ensure a wide choice of Trucks with expert advice to ensure the RIGHT TRUCK for the application and requirements while always offering our expert advice on any of your requirements. Dechmont Forklift Trucks stock a wide variety of Trucks and Mechanical Handling Appliances. 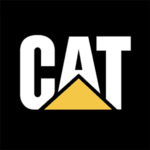 Our dealership with CAT® is a valued addition to our fleet of vehicles. With this, we are able to offer any combination of Warehouse Handling Equipment and CAT® Counterbalance Trucks, on top of premium products from additional specialist brands. As your business needs develop and change, our expert Sales Executives and Engineers are on hand to review and advise you on your Forklift Truck needs. Ask us for a FREE Site Survey to assess your building capabilities and your handling needs. 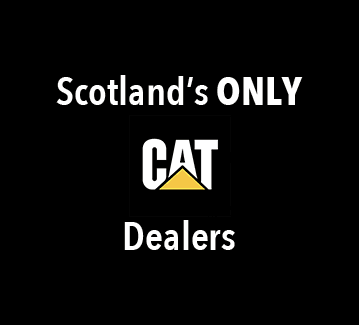 SCOTLAND’S ONLY DEALER FOR CAT FORKLIFT TRUCKS. 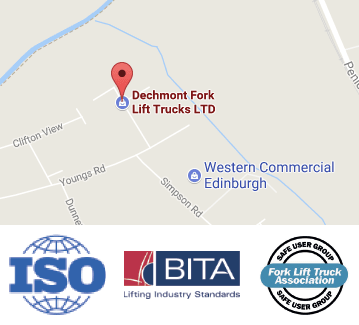 Dechmont Forklift Trucks are delighted to be Scotland’s ONLY Dealer for CAT® Forklift Trucks, a valued addition to an extensive workshop capability and forklift operator training carried out at our Centre in Broxburn, near Edinburgh. The Dealership was signed in April 2017 and secures an already concrete relationship between Dechmont Forklift Trucks, Impact and CAT® Lift Trucks. With this, we are able to offer any combination of Warehouse Handling Equipment and CAT® Counterbalance Trucks, on top of premium products from additional specialist brands. CAT®’s comprehensive range of forklift trucks and warehouse equipment enables you to choose the right lift truck for your application and the most capable tool to help improve your organisation’s effectiveness and get the job done. All Materials Handling Equipment has been designed and built to reflect CAT® Lift Trucks core brand values of ruggedness, durability and serviceability and along with understanding our customers’ requirements, these values are at the heart of what we produce. By understanding that efficient materials handling is achieved by maximising productivity for the lowest possible total cost of ownership, and to keep pace with the ever-changing needs of industries around the world, our research and development programmes continuously strive to deliver new and improved forklifts and warehouse equipment. And with greater performance and longer service intervals, these forklift trucks give CAT Lift Trucks the competitive edge. This enables us to supply you with the most effective and efficient products to achieve your operational goals. Helping you to find the right product for your specific requirements and maximize your operational efficiency, we offer a broad choice of LPG, diesel and electric powered lift trucks and warehouse equipment including pallet trucks, low and high-level order pickers and reach trucks. Together with our dedicated dealer network across Europe, we are committed to providing you with comprehensive materials handling equipment and cost-effective machine selection for use in a wide variety of industries and applications.